Windows Vista is the new operating system from Microsoft. It offers new and improved features. It also offers some of the same features that we are all used to. 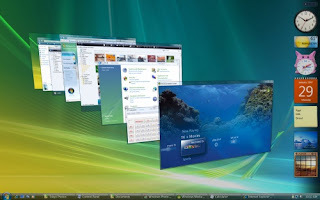 Windows Vista came out earlier this year and offers a new visual interface. This new Windows Vista visual interface is called Windows Aero. There are also new tools included within Windows Vista like a new DVD Maker that many users like. Microsoft is also trying to link Windows Vista with their other home console - the XBOX 360. Of course, with each new operating system comes some criticism. One of the best and newest advantages of Windows Vista is its new security features. Windows Vista provides great security features that help to prevent people from hacking into your system. If you try to do certain sensitive actions, it will ask you for a password. This will help to prevent people from entering your system without permission. The new version of Internet Explorer in Windows Vista has also upgraded its security features. It has new filters and parental controls to keep you safe while you are surfing online. Windows Vista also sports a new robust anti-spam guard. This is called Windows Defender, and it will help keep you safe from spyware and adware that can slow down your system. Windows Vista’s security features aren’t the only new advantages to the operating system. There is also a new, more visual, user interface with Windows Vista. Microsoft has called this Windows AERO. The AERO stands for authentic, energetic, reflective, and open. It is a new 3D interface making it easier to use. All the new graphics in Windows Vista will really take advantage of the new technology they have added to the operating system. Windows Vista makes it easy to set up small business offices to large mega corporations. It does this using its new imaging technology. Using this new Windows Vista technology, it has become more cost effective to switch an entire office over to the new operating system. Microsoft has also made it easier to use applications on Windows Vista. With its improved peer-to-peer sharing, as well as .NET framework, it has become easier to use a variety of applications. Windows Vista provides new levels of stability as well. Its new driver system makes access and using most program drivers more stable. They have designed a sort of two-tier system which can help prevent crashes. The new Windows Vista system also will detect driver problems as soon as they occur, and the program will restart it automatically without having to reboot the entire system. Another great new feature to Windows Vista is a feature called sleep. It takes the best qualities of hibernate and standby and combines them into one. With sleep, in Windows Vista, you can quickly and easily temporarily stop your computer without having to shut the whole thing down. This is also a great energy saving tool embedded in Windows Vista as well. A new program called SuperFetch allows for Windows Vista to access and load programs faster. No more wait times. SuperFetch with Windows Vista uses a new intelligent proprietary system based around the programs you use often. It pre-loads these files or programs into its memory so it can launch them faster. This eliminates the slow response after rebooting your computer with Windows Vista. In the past, if your computer started to run slowly, it was usually an issue with your RAM (random access memory). After that, you would have to remove the RAM and add more to fix the problem. This can void warranties, or it can just become a hassle, especially if you don’t know what you are doing. With Windows Vista, you can now plug in a USB drive or flash drive, and Windows Vista will use that to help boost its performance. No more rebooting, or having to buy new RAM chips with this OS. There are many new advantages to Windows Vista. They have put a lot of effort into making an operating system that everyone will enjoy, and that is easy to use. They have added new security features to Windows Vista to keep you safe while you are on the net and off. There is a new visual interface to make it easier to use, and Microsoft has really addressed some of the issues of the previous operating systems with Windows Vista. Although nothing is perfect, Windows Vista seems to have all of the answers for now.